Masamune Oguri, Naohisa Inada et al. This composite image shows SDSSJ1226-0006, a new gravitationally lensed quasar discovered in a Japanese survey announced on April 11, 2012. 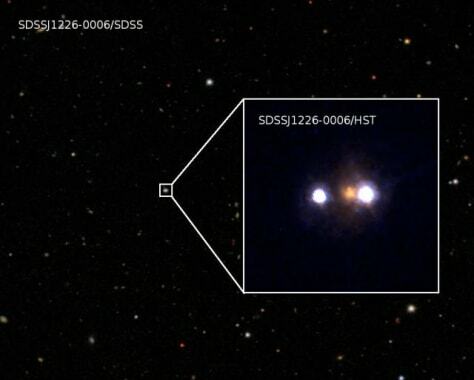 The quasar image in the original image of the Sloan Digital Sky Survey, which was used to search for survey gravitational lensing, looks only slightly extended, but the Hubble Telescope view clearly shows two distinct quasar images (white) as well as a massive galaxy in between the quasar images (orange) that produces gravitational lensing.